About: The Two Brewers sell a wide selection of drinks including beers and spirits and serve a variety of traditional pub dishes. Catering for private parties of up to 40 guests is available upon request. In addition to this, they also have fruit and quiz machines. We'd had an awful journey into London so relieved when staff and regulars made us welcome. Interesting beer. Trad food arrived quickly and was hot, plentiful and tasty tho not for healthfood fanatics! But they happily substituted a little salad for mushy peas. Open fire and oldie worldie decor appealed to me. Most of all, good to be in a London pub where you can have a conversation - important as we were having a v hasty gettogether with our son. Will be back! I go to this pub before going to the theatre. The Staff are very friendly and there is normally a decent choice of beers with guest ales from time to time but always Doombar and a Youngs ale or two. The food is of a good standard for a pub, there is plenty of seating. 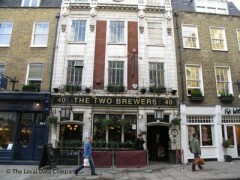 We had decided to go to the Two Brewers just before going to the theatre on Saturday night. We were supprised at how busy the pub was, however the staff were very happy to try and find us a seat when we asked, becuase we were in a rush to eat. Not only this, but the food arrived very quickly within aout 10 or 15 minutes, and of a very good standard. There was one bar man in particular, who made us feel very welcome, so much so that after the theatre, we came back for another drink! Nice to visit a pub who puts customers first for once, well done!